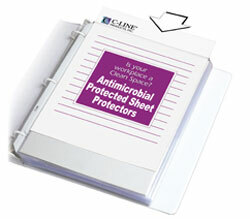 Heavyweight project folders feature acid-free polypropylene with built-in antimicrobial protection. Antimicrobial protection helps prevent the growth of stain causing bacteria, yeasts, molds, and fungi. Open on two sides with thumb cut front for easy access. Reduced glare. Triclosan-free. For 11 X 8 1/2 documents. 25/BX.